The format of political engagement between Russia and Thailand is changing before our eyes. The countries are building a new model of interaction that responds to their core national interests. How quickly does the world in which we live change! Just thirty years ago, it would have been very difficult to imagine that Russia and China, who had been ardently fighting each other over the course of decades, would become political and economic partners. Who would have thought that ASEAN, which from the moment of its creation conducted a decisive war on communism, would accept into its ranks the socialist countries of Indochina - Vietnam and Laos? Would it have been possible to imagine that the leaders of Russia, China, the US and the ASEAN countries would sit at one table at the East Asia Summits and hold a constructive dialogue on the current problems facing the Pacific Rim Region? One of the most remarkable trends in the current phase of the evolution of the international relations system is the demarcation between those countries that consider intervening in the affairs of others a norm and those that more than anything else cherish the principle of independence and sovereign equality of nations that is written in the UN Charter. The forming world order will be founded not only on the rule of law, indivisibility of security, democracy, market economy, inviolability of human rights and basic freedoms, but also on equality, mutual respect and consideration for each other's interests. Russia and Thailand are united in their evaluation of global security threats: terrorism, drug trafficking, cross-border crime and the proliferation of arms of mass destruction. Our countries have common or similar approaches to regulating the situation in the Middle East, around Syria, in Libya and Yemen, the Iran nuclear dossier and the nuclear problem in the Korean peninsula. In the UN General Assembly, Russia and Thailand vote practically in unison. Let's take the current 69th session for example. Our positions did not differ in one significant resolution. Of special value was Bangkok's support in the resolutions that Moscow proposed. In particular, the resolution on Combating glorification of Nazism, neo-Nazism and other practices that contribute to fuelling contemporary forms of racism, racial discrimination, xenophobia and related intolerance. We are grateful to our Thai partners for their invariable position in favor of increasing Russia's role in the Pacific Rim Region and the support for our initiatives aimed at forming an equitable architecture of reliable security and sustainable development in the region. In the framework of Eastern Asian summits, we are interested in discussing future steps for strengthening regional security and cooperation. Russia and Thailand successfully interact in the existing Pacific Rim Region multilateral dialogues. At the Asia-Pacific Economic Cooperation forum, our countries worked together on the Smart Traveller Program, a project that provides measures for guaranteeing tourist security and encouraging international traveling in the APEC region. While in the framework of the ASEAN Defense Ministers Meetings Plus, the countries manage to work for the creation of the ASEAN Military Medicine Coordination Centre in Bangkok. Russia will actively participate in the preparation and realization of the second Asia Cooperation Dialogue Summit in Thailand in 2016. In 2016, Russia and ASEAN will celebrate the 20th anniversary of their partnership. Thailand is one of Russia's key partners in Southeast Asia and Bangkok's voice in the future intensification of Russian-ASEAN ties in various fields has a very important meaning for the development of the association policy in relation to Russia. Thailand is striving to play a more outstanding role, in ASEAN and on the international arena in general. Bangkok has applied for the position of a non-permanent member of the UN Security Council in 2017-2018. It is known that Russia is a permanent member of the Security Council, the organ that reviews questions of supporting international peace and security. If in the course of the elections, which will be during the General Assembly's 70th session in September, Thailand is elected to the UN Security Council, then our foreign ministries will have the opportunity and necessity to embark upon closer interaction concerning the entire international agenda. This year will mark the end of the Plan of Consultations between the Ministry of Foreign Affairs of the Russian Federation and the Ministry of Foreign Affairs of the Kingdom of Thailand in 2013-2015. A new plan of consultation for 2018 will have to be prepared, one that, judging by the sides' moods, will embrace a broader spectrum of issues in respect to the previous one. Issues of interaction in world and regional affairs are always an important aspect of dialogue between the two countries' heads of state, heads of government and foreign ministers. This dialogue has a good dynamic. In October 2003, Russian President Vladimir Putin made a state visit to Thailand. 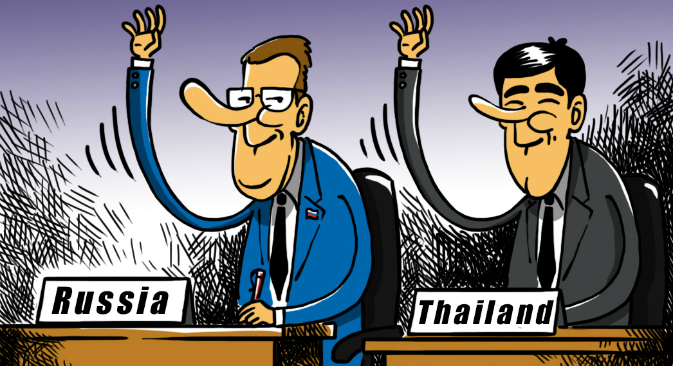 In July 2009, the Russian foreign minister visited Thailand and in March 2013, the Thai foreign minister came to Moscow. In April this year, Russian Prime Minister Dmitri Medvedev visited Thailand.